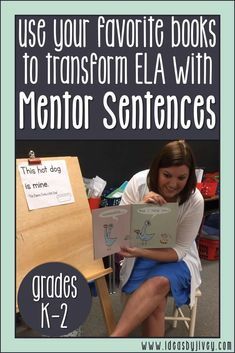 Close reading turns those mini-lessons into MAXI-lessons if you try to fit in all that you want to do with a text in one day. 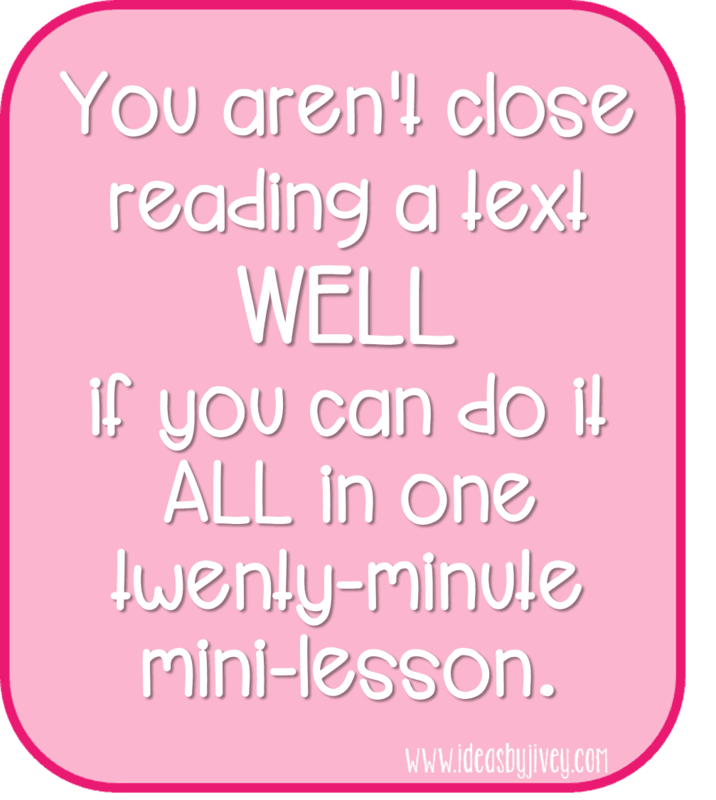 In other words, you aren’t close reading a text WELL if you can do it ALL in one twenty-minute mini-lesson. 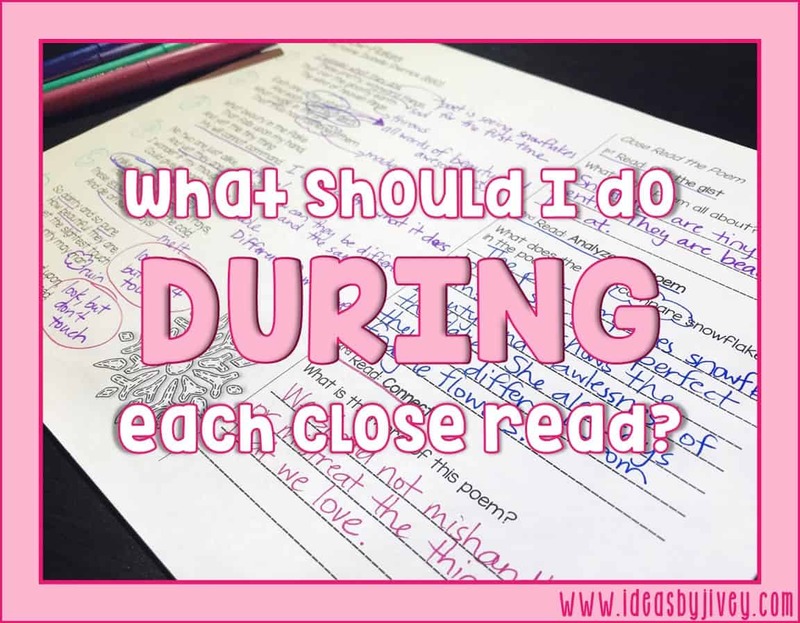 That doesn’t mean you shouldn’t do close reading as mini-lessons! 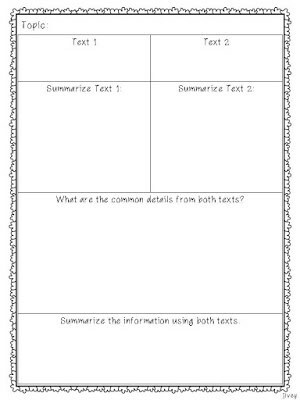 Break up the tasks over several days to dive deep into a text. As you saw in my last post about annotation, the first read is always the longest and often can’t/shouldn’t be done in a twenty-minute mini-lesson (that doesn’t mean always!!) because of the time it takes to dissect the vocabulary, annotate, and discuss the text. 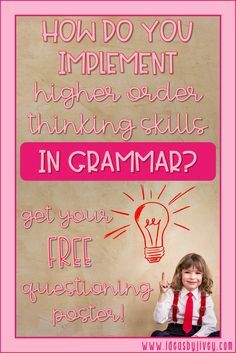 So What Can Be Done As A Mini-Lesson? 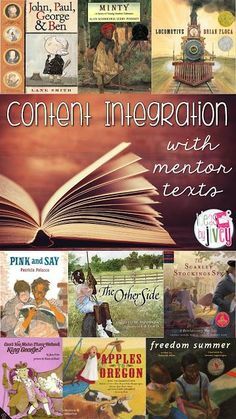 Each subsequent read should focus on just a portion or a chunk of the text, so these reads are perfect for mini-lessons! 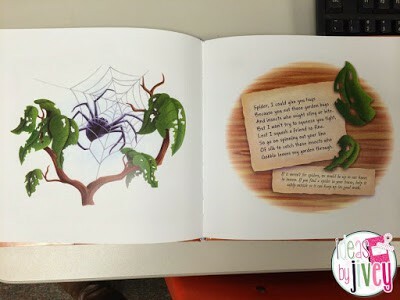 Check out this video to hear me discuss what this looked like in my classroom, or continue reading below! 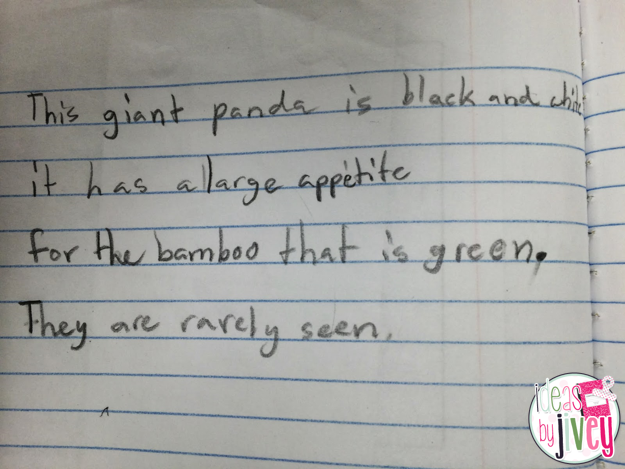 I am a bit of an admitted poetry nerd. 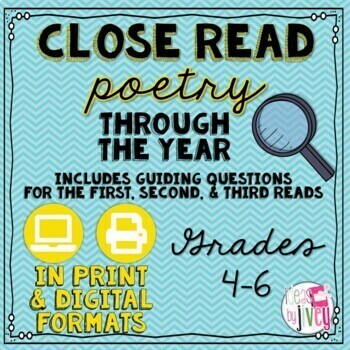 I am going to share how I would use a poem for at least three days in the classroom to practice close reading, but keep in mind, all of these steps can be done with ANY text! 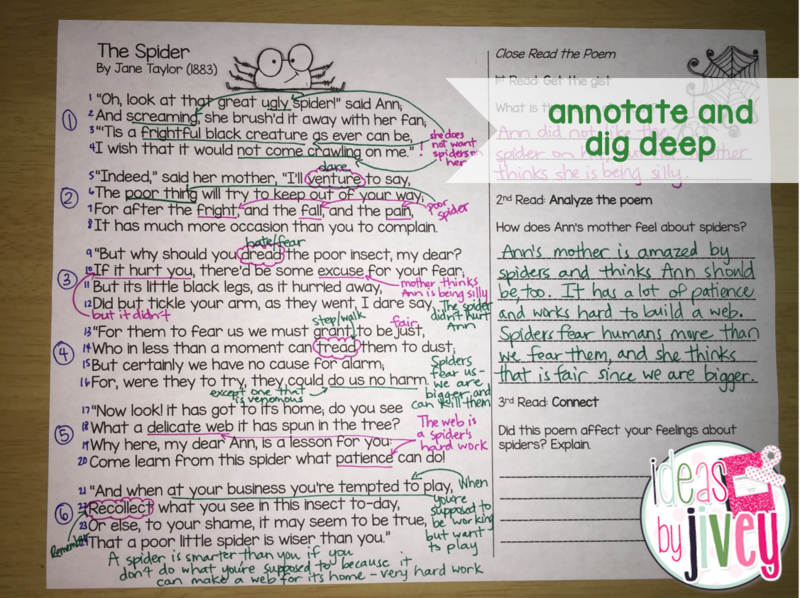 The first thing you want students to do in a close read is to identify “chunks” or sections of text to read one at a time. This helps to not get too overwhelmed. 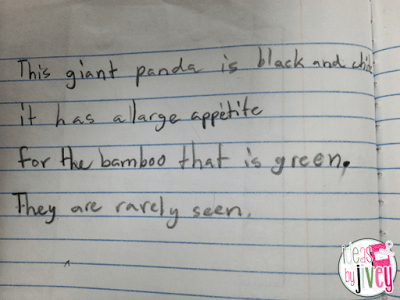 In an article or non-poetry passage, it might already have great reading chunks with paragraphs. 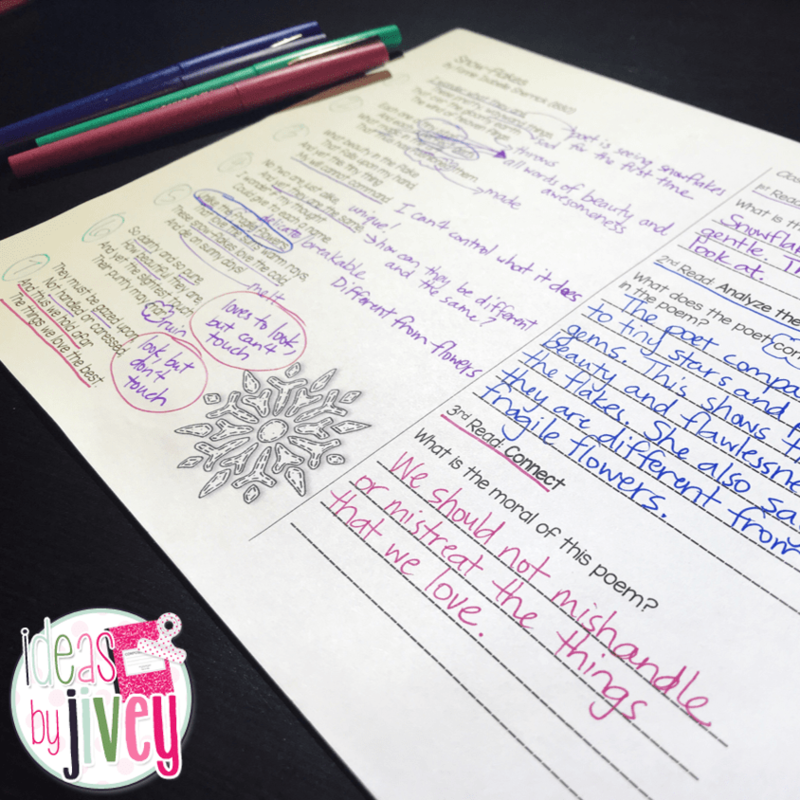 With poetry, if the poem is written in stanzas, this is a great way to break up the poem… AND you can hit that “identifying stanzas and verses” standard. 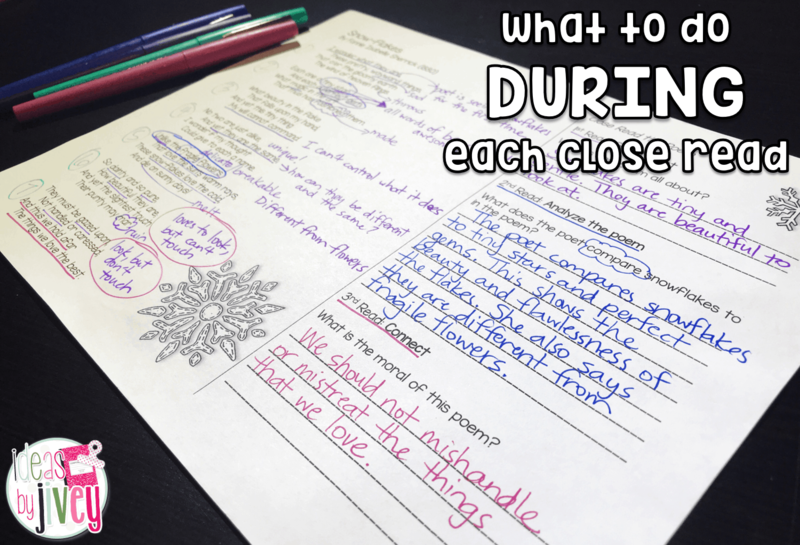 Students should have a purpose for each time they close read a passage, article, or poem. 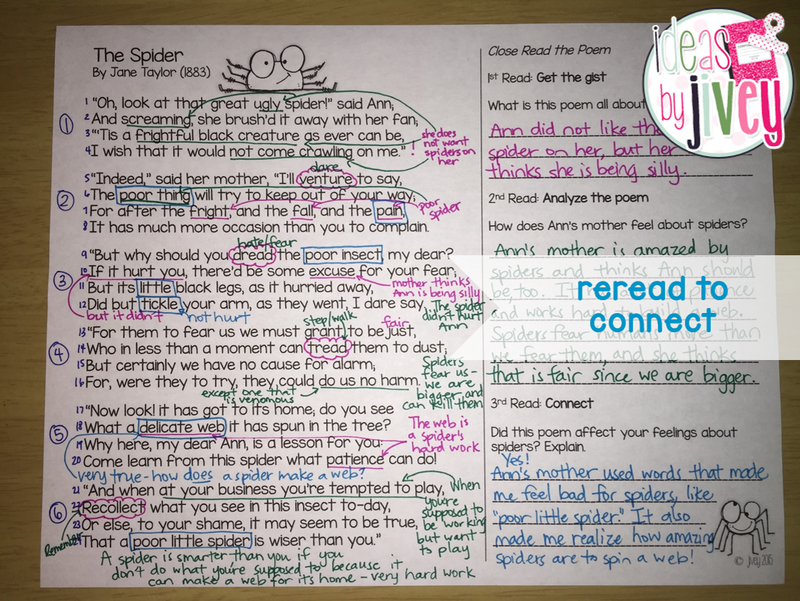 The first read should always focus on key ideas and details, such as getting the gist/summarizing/identifying the main idea. After all, when you read something for the first time, you are only trying to grasp and understand the idea of it, right? 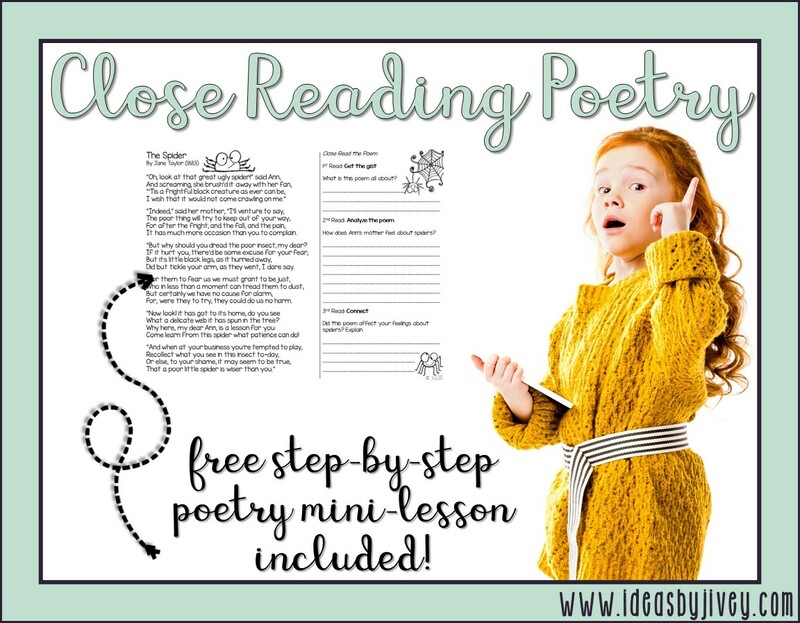 If you are using this poem for mini-lessons, in order to keep each lesson “mini,” you’d do the second read in a new lesson. 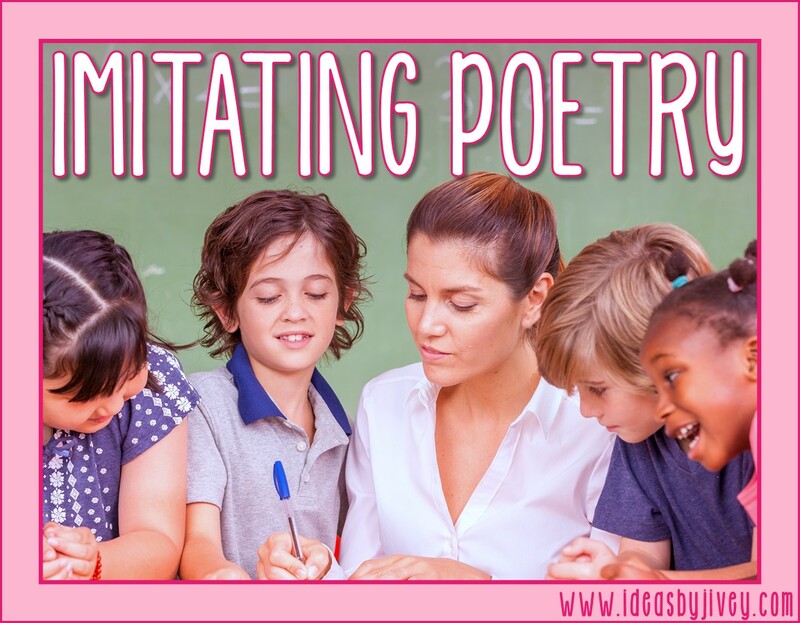 Before beginning the mini-lesson, I always have my students discuss with a partner or small group the key ideas and details of the poem from the previous lesson, just to get their brain going again about the poem. Generally, the second read should focus on craft and structure. 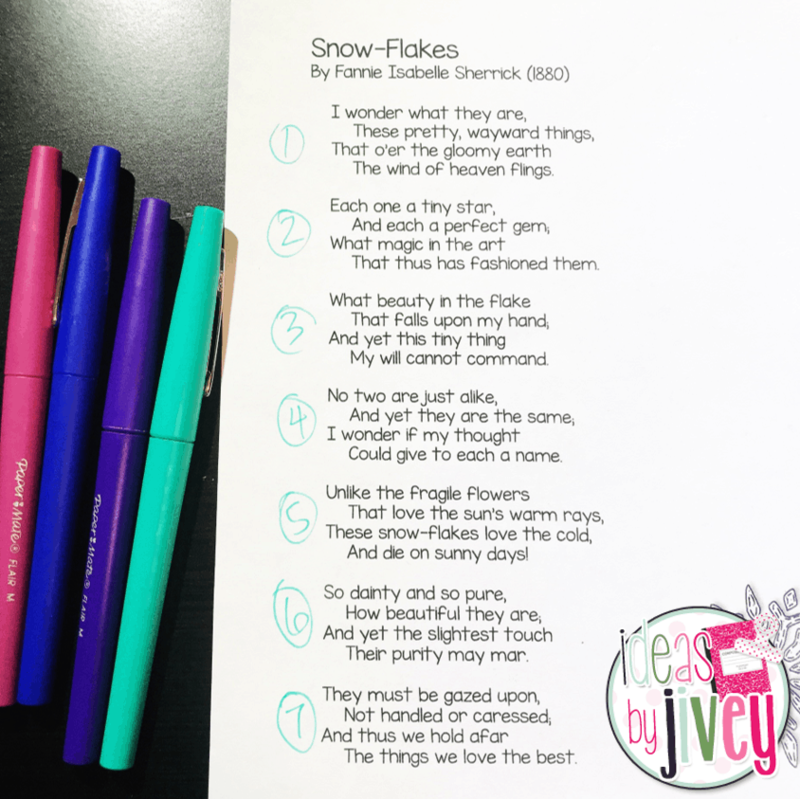 You can see in the image above, for this poem, I want students to find figurative language (craft) in the poem by identifying items to which the poet compared snowflakes. 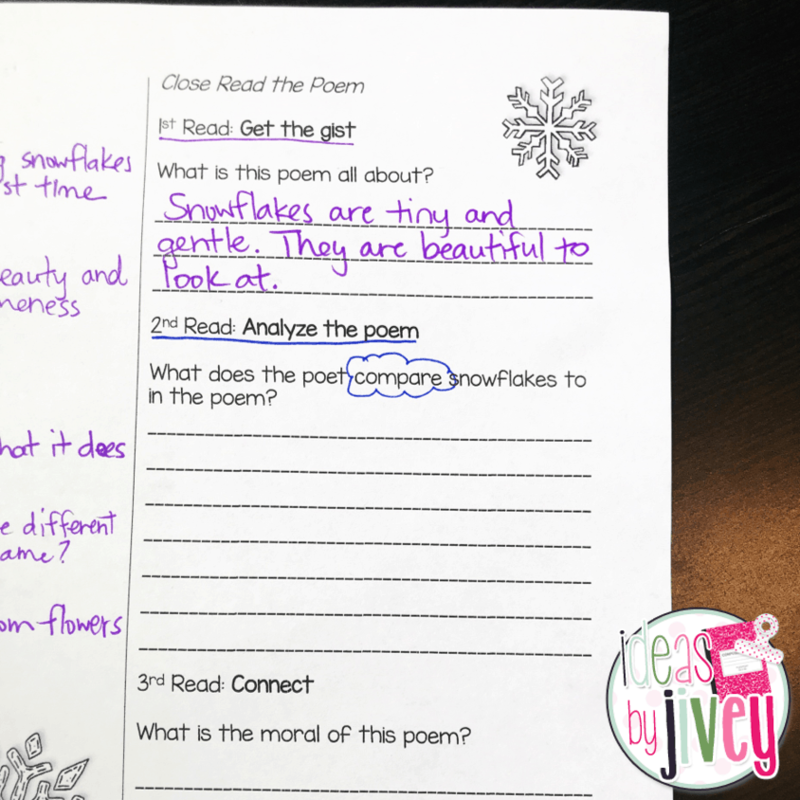 I would then have the students work with a partner or in a small group to use what we found in the poem to answer the question, then we would come back and discuss their responses as a whole group. 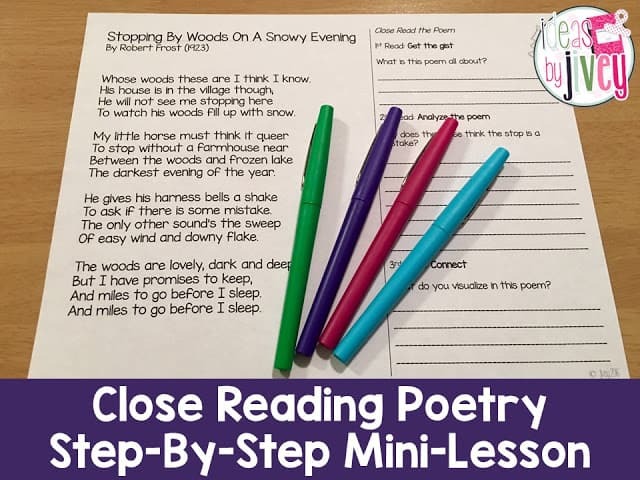 For the third mini-lesson, and/or the third read of the poem, they will have a new purpose. 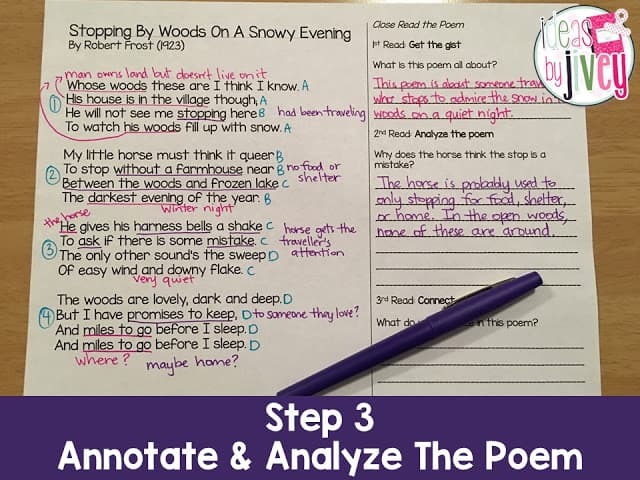 The third read should go deeper into the meaning of the text you are reading, so focusing on integration of knowledge and ideas is a good requirement that will allow students to analyze the text (and sometimes multiple texts). 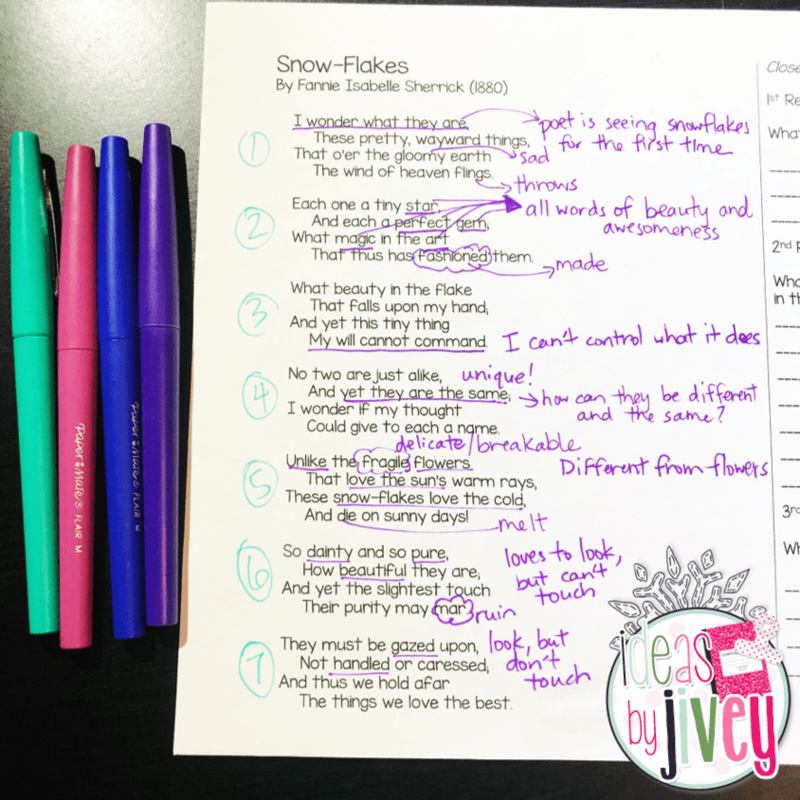 I would work with my students to identify the moral by returning to the notes we made in the last two stanzas. 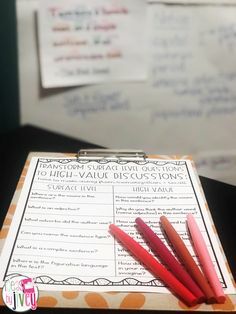 Again, I would want students to talk with a partner or small group to form a good response, and then we would discuss it together as a class to make sure everyone is on the right page. 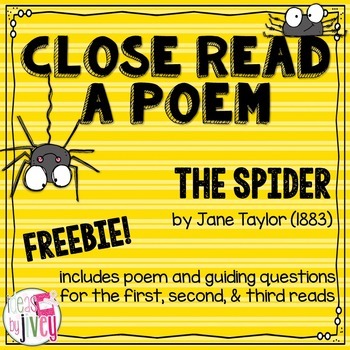 The poem used in this lesson is found in my Close Reading Poetry Through The Year resource. 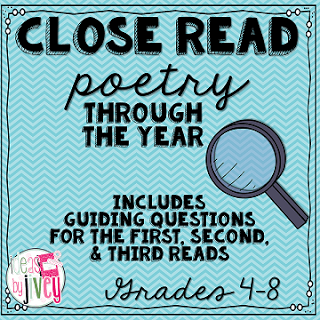 For more tips on close reading poetry specifically, check out these posts (with bonuses)! I will be sharing more about close reading, finding and citing evidence with text-dependent questions, and writing constructed responses in future posts! 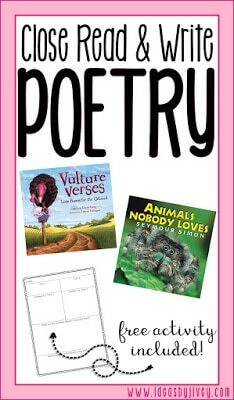 Before I would ever open the book, we would do some close reading with the poem, The Red Wheelbarrow by William Carlos Williams, which is a great one for visualization. It’s also super short and pretty easy to analyze. Nope. The book would remain on the tray of my board, taunting them. 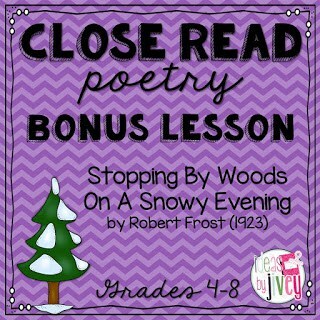 The next day, we would do some close reading with the poem, Stopping By The Woods On A Snowy Evening by Robert Frost. 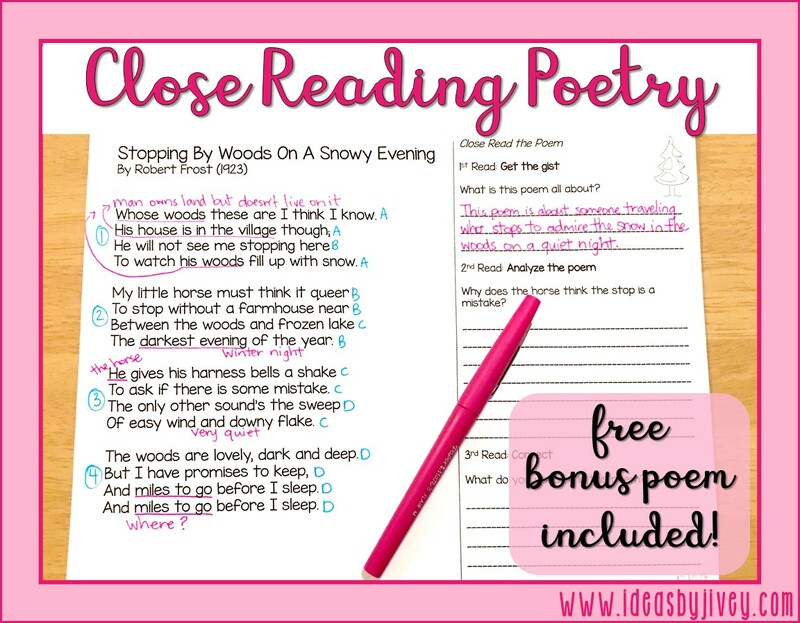 This blog post will walk you through how I would teach them to do close reading with a poem… and be sure to stick around for a BONUS at the end! 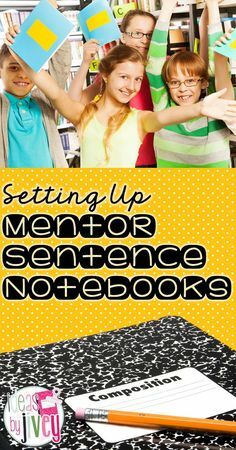 I liked to use different colored pens as I went through the steps so my students could see how my thinking progressed. This is a great technique when you can display your “live” work on the board with a document camera. 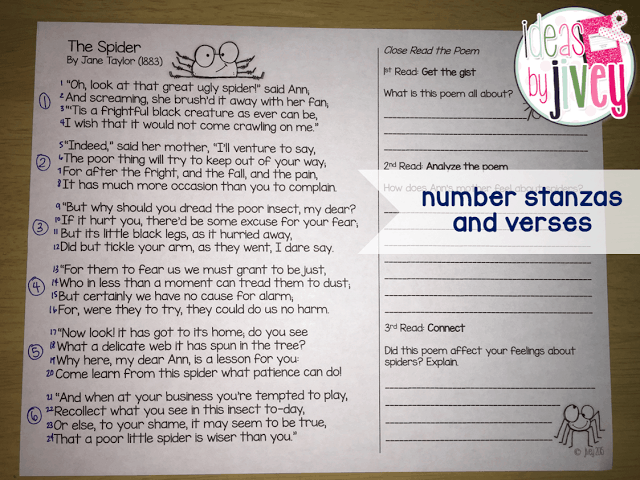 First, I would label stanzas and rhyme scheme. You can also number the verses for the purpose of future discussions, but since this one is pretty short (and the verses are not very wordy), I would just have students refer to the stanza they are talking about when discussing. 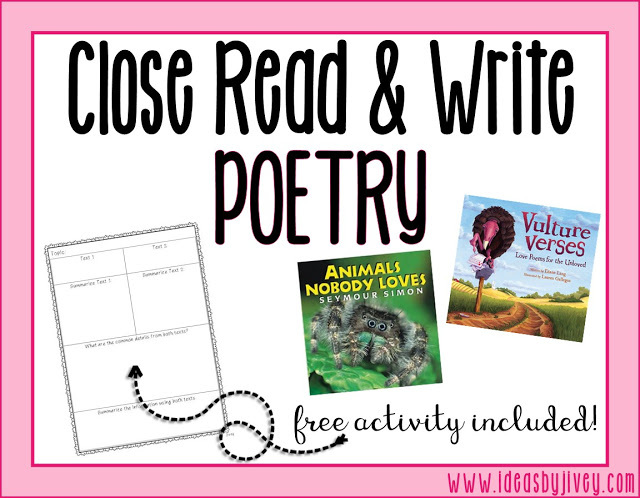 If this is the first time you are close reading a poem together, I would definitely do it “think aloud” style. 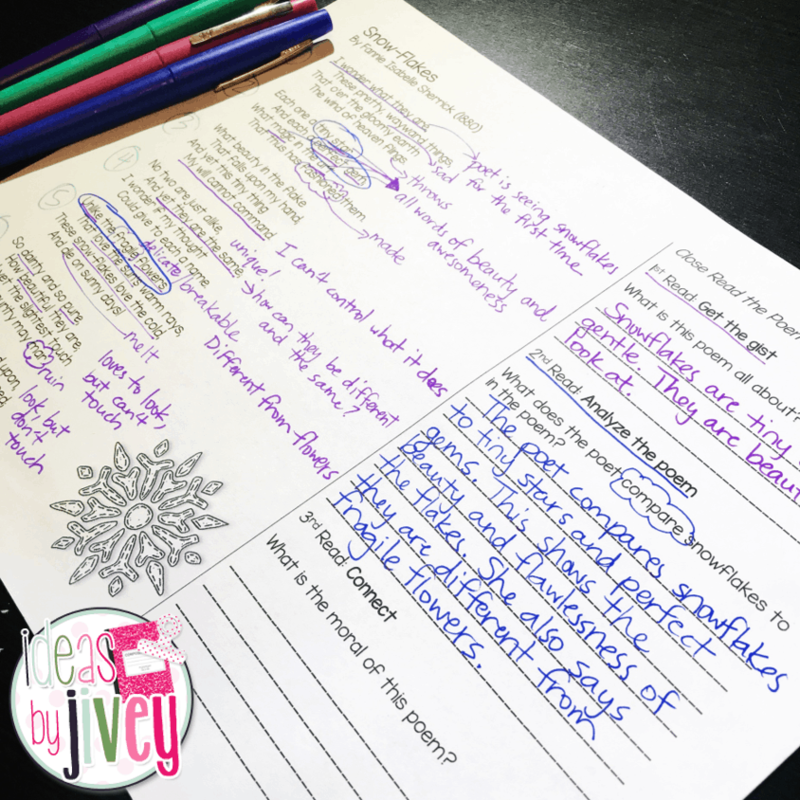 Read it aloud, and as you come across things that “jump out” to you (or that you want to jump out to students), stop and talk about your thoughts as you jot them down. 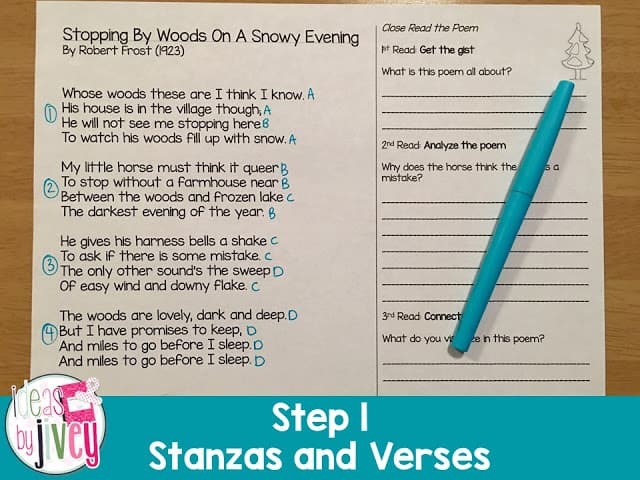 For example, the first stanza talks about the woods being owned by someone who doesn’t live there. 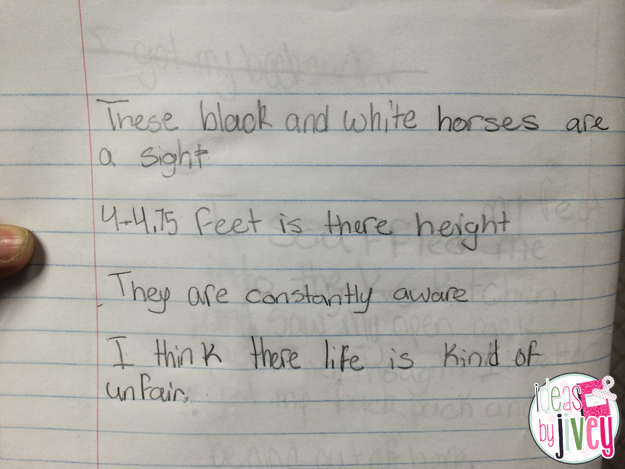 I would underline and annotate this thought as I read to them. 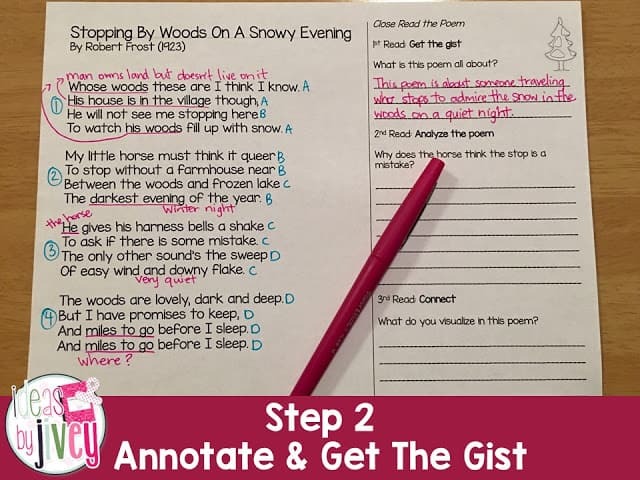 After going through the entire poem this way, write a short summary: the gist. I would point out the word “stopping” means that they had been moving, or traveling. I would also point out that there is no farmhouse, and they are basically in the middle of nowhere. This would probably confuse the horse since he most likely is used to only stopping for food or shelter when traveling, or when they arrive home. He shakes his bells to get his owner’s attention. I would also start a discussion about promises- who do you make promises to? (Most will likely reply to people they love or care about.) 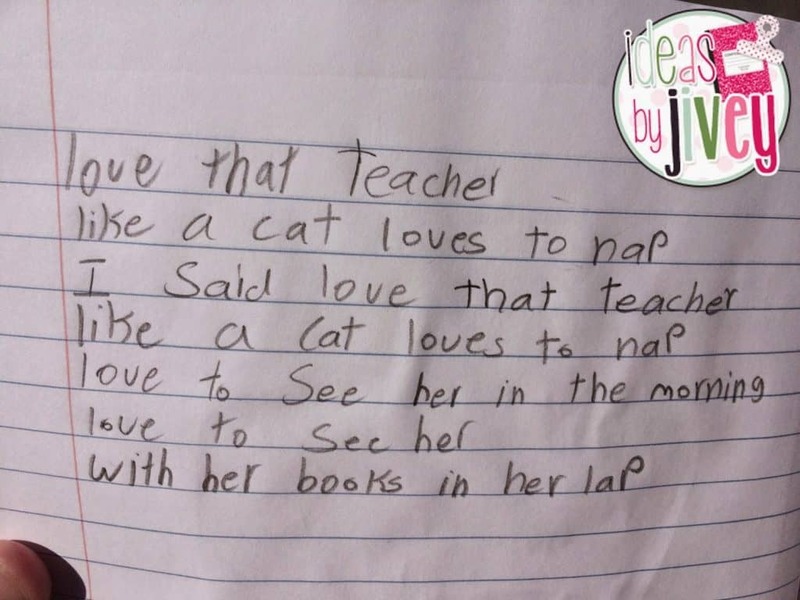 This will lead to a great new discussion, where do you think they are going in the poem? 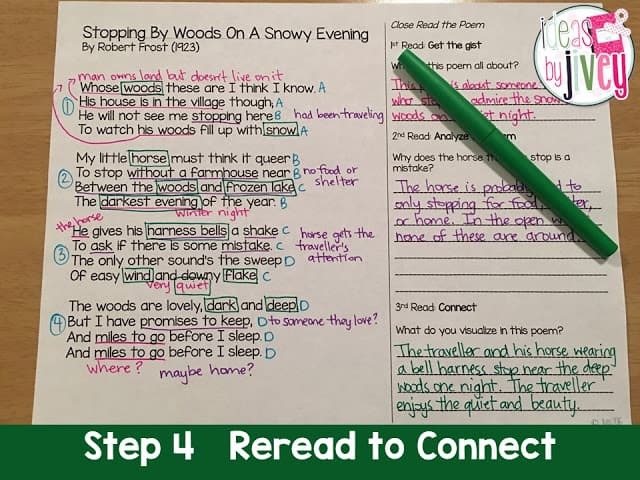 Finally, the third read could be done on their own, but again, if this is the first time you are doing this with your students, I would still walk them through the last step. 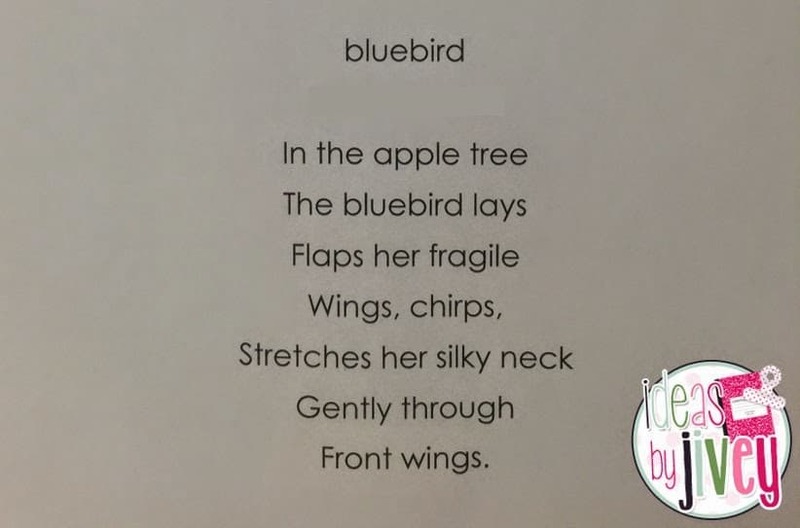 To connect to this poem, students can visualize it. I like to mark words that stand out to me that help me visualize. You could do this all in one day, or stretch it over a couple days. 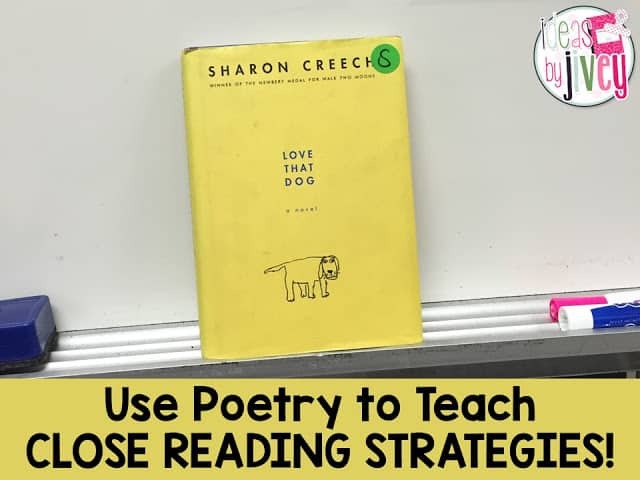 And of course, your students are STILL WAITING for you to start reading Love That Dog! 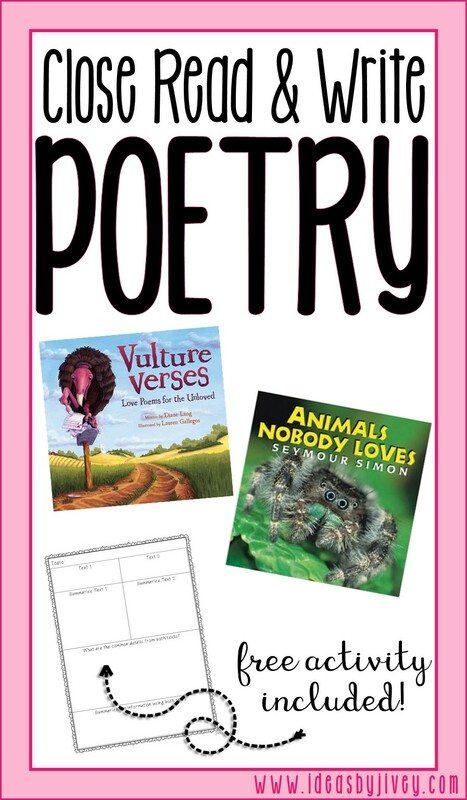 Now that you’ve read these two poems, you’ll at least be able to start the book. 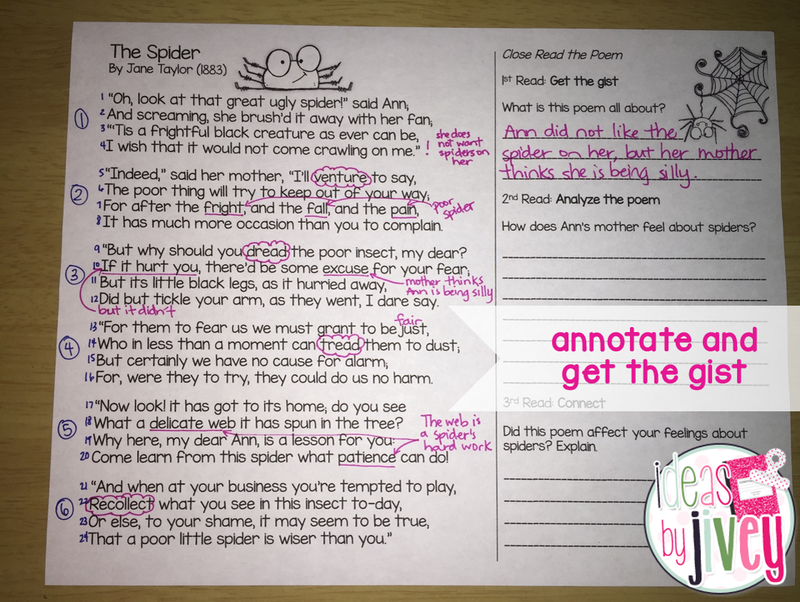 To make sure that the students know the poems Jack is referring to throughout the book, look ahead and see when it is necessary to analyze a new poem! If you want to use this poem in your room, either with Love That Dog or without, you can get the lesson you’ve seen in this post for free here! 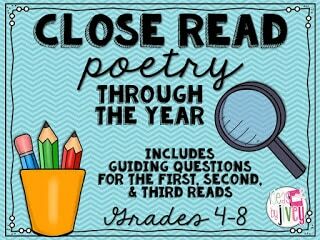 to give you a poem for every month of the school year! 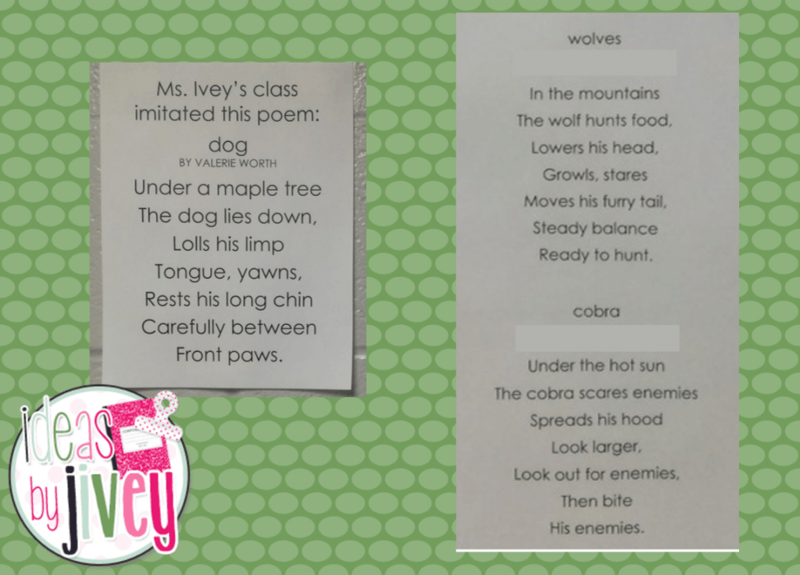 We have had some serious fun with poetry using Love That Dog. If you’ve never read this book, it is a MUST with a poetry unit! Check it out here! 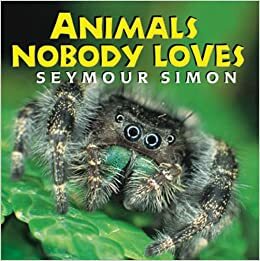 It’s a little sad, but even still, my kids have loved it the last few years. 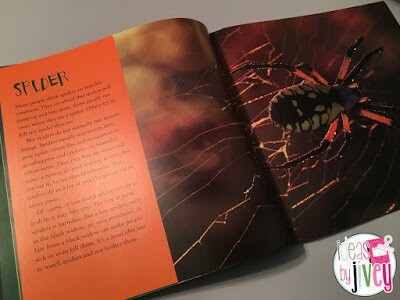 Those of you that already follow me know that I think imitation is a must for kids to learn the craft of writing. 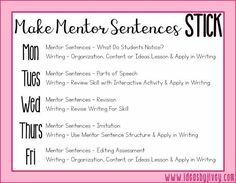 I do this weekly through Mentor Sentences. 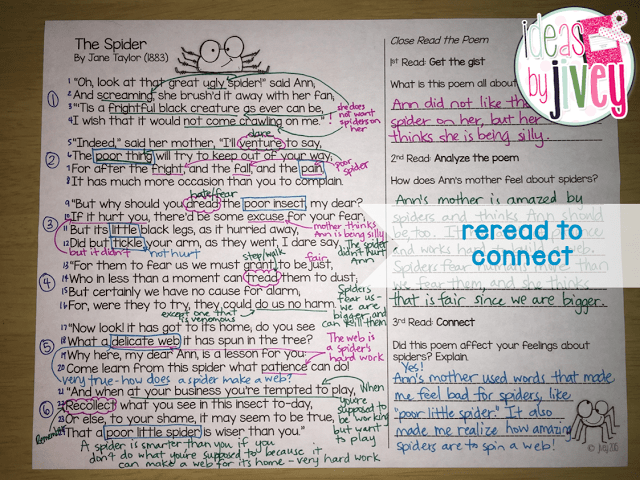 Analyzing the structure and craft of an author, then trying it out: that is the BEST way for students to learn to write! 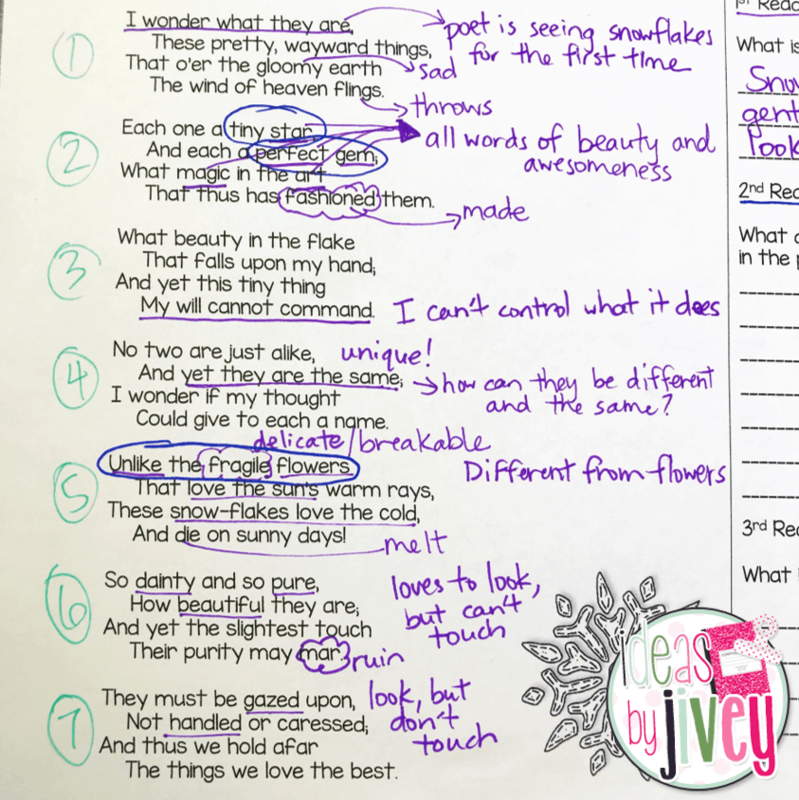 You get the idea… we only did the first seven lines because I thought that would be “enough.” They had a bit of a struggle getting started, but once I gave a few of them ideas to start, they really flew… and they BLEW ME AWAY with their imitation poems! The two students above are ESOL students, and they rocked it! 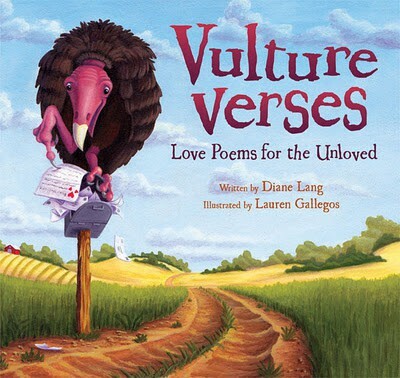 I wish I could share all of their poems with you. 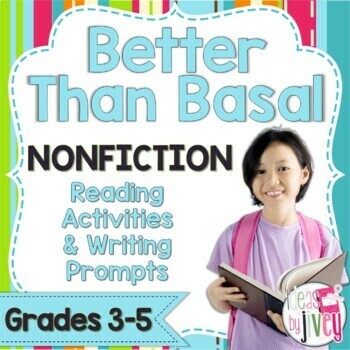 They have really grown as writers and readers this year. I am so proud of them! 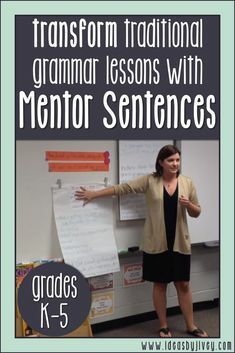 Definitely give this a try with your students- I think you’ll be surprised at what some of them do!